It goes without saying that human rights abuses relating to religious persecution are widespread throughout the world and on the increase. Even today, Asia Bibi, who has been beaten and raped during her six years on death row in Pakistan, will have one last opportunity to plead for her life to be spared. Her crime, as a Christian, was drinking water from the same bowl as her Muslim co-workers. During the ensuing argument she was accused of blasphemy against the prophet Mohammad, which led to her arrest and conviction. There is an overwhelming need for governments across the free and democratic world to take a stand and defend the basic human right that Eleanor Roosevelt, chair of the Universal Declaration of Human Rights drafting committee, described as one of the four essential freedoms of mankind. Under the auspices of the United Nations, a global gathering of religious leaders and thinkers to formulate an agreed set of principles that are sustainable theologically within their respective faiths and on which member nations can be called to account… We have not yet done the theological work for a global society in the information age, and not all religions in the world are yet fully part of that conversation. 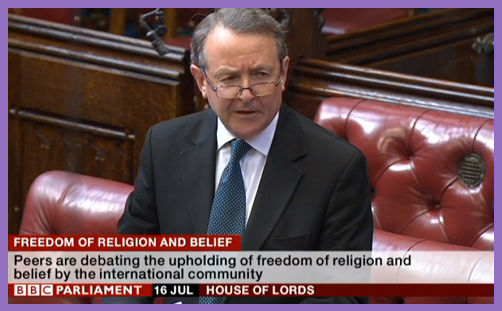 But if we neglect the theology, all else will fail… We must stand together – the people of all faiths and of none – for we are all at risk… Religious freedom is about our common humanity, and we must fight for it if we are not to lose it. Religious freedom is threatened on a global scale, as we have heard, but also in a very complex way. Attacks on religious freedom are often linked to economic circumstances, to sociology, to history and to many other factors. Practically, if we are to defend religious liberty, we have to draw in these other factors. For example, if we want to defend religious freedom around the world – and again I say, the freedom to have no religion – do not sell guns to people who oppress religious freedom; do not launder their money; restrict trade with them; confine the way in which we deal with them; and, above, all, speak frankly and openly, naming them for what they are.